What’s got the stocks of two of the world’s biggest automakers so cheap, and why investors might want to be interested. Ford (NYSE:F) and General Motors (NYSE:GM) are both trading at notably low valuations compared to their price-to-earnings ratios. In this clip from the Industry Focus podcast, Motley Fool analysts Sean O'Reilly and John Rosevear take a look at why that is. Find out why cycles lie at the heart of the valuation, and why the market thinks the companies are in their least profitable part of the cycle. Also, the hosts look at how the companies are doing in sales for their more profitable vehicles and how crossover sales are affecting the global auto marketplace. Sean O'Reilly: You look at the valuations on Ford and GM, and you're just like, "What is going on here?" The multiple on the market's 18 or 20 and you've got Ford with a P/E of 6? Why are these so cheap by any reasonable measure? John Rosevear: There are a few explanations. First of all is, these are big, old-school cyclical industrial stocks. It's not an uncommon pattern if you look way back in history that they cruise around a price-to-earnings ratio of 10. But then, profits start to rise as the auto market moves toward a peak, and the P/Es shrink. The reason they shrink is because investors start to say, "Wait a minute, if the market is peaking, that means profits are going to start to shrink in time." That's just how they've always behaved. There's a certain amount of that going on right now, but these are really low. GM's P/E right now, trailing-12-month basis, is 4.3 or something. It's really low. It's nowhere near 10. You look at the Wall Street estimates for earnings and they're good. They'll be up this year. They'll be up more next year if the estimates follow through. They had a good year last year, earned just over $5 a share, which is very good for GM, well over $10 billion before taxes. There's strong businesses. We're way past bankruptcy. We're way past the economic crisis. Both companies have very strong management teams. Ford especially, you can say this company is battle-tested. These guys all went through the near-death experience. They all worked closely with Alan Mulally -- Mark Fields, CEO, was Alan Mulally's right-hand guy for several years. He was really the architect of the turnaround. Ford is trading at about six times earnings. With this crack management team, with very good sales in the U.S., with promising things going on overseas, what is the story? I think a certain amount of the story is just the cycle. The market for new light vehicles -- light vehicles is our technical term for cars, pickup trucks, and SUVs, thrown together. Basically, things people buy to own and drive in their garage, versus big trucks. We have a chart. I don't know if the readers will be able to see it. We have a chart that Sean and I have been looking at today. O'Reilly: If you want the chart, we'll email it to you. Email us at industryfocus@fool.com. All right. Sorry, John. Rosevear: Everybody had an Escalade. The margins on these things were fat. Toyota was trying to figure out how to make SUVs, and all these things. Then, of course, as we know, the market turned. Gas prices went up. 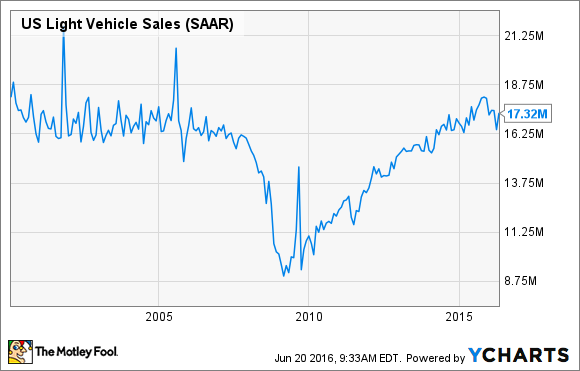 SUV sales stalled. The economic crisis happens. GM and Chrysler crashed in a bankruptcy court and all that. But before that, the pace of auto sales in the U.S. was extremely strong. We're close now to that pace. That makes analysts think, "Huh, maybe there's not a lot of growth left here." Profits may not drop for a while. They could cruise at this level for a few years. But growth may be hard to come by. Of course, as investors, we want growth. For Ford, North America accounted for 61% of its total global revenue last year and 86% of its pre-tax profits. O'Reilly: Correct me if I'm wrong: That's because Ford's real moneymaker is trucks. There's nothing Americans love more than a Ford F-150. Rosevear: F-Series, you got it -- F-Series, that's what we call it. F-Series is F-150 and the Super Duties. The F-250, F-350, and so forth. We track them as a group. Ford reports results for them as a group. Ford's most important product in the whole world. They sell a ton of Focuses and so forth in China. They sell all sorts of cars in Europe. Pickup trucks, it really comes down to pickup trucks. Rosevear: Yeah, it's been a big movement. This is a global trend, an industrywide trend, people going to crossovers. A crossover is basically, simply put, it's a cross between a car and an SUV. It's an SUV-shaped vehicle that's built on a car architecture instead of built on a heavier pickup truck frame. This makes them lighter. This makes them handle more like cars. This makes them ride more like cars, and it makes them more fuel-efficient. A trend that's going on separately, and this is also driving big profits for GM and Ford in North America, is people are giving up cars for crossovers. People are trading in the Ford Fusion for a Ford Escape or an Explorer or an Edge. Likewise at GM, likewise at really all of the automakers, this has caught some by surprise. You have companies like Honda, which, for years, the bread-and-butter has been the Accord and the Civic, the smaller sedan and the bigger sedan. The CR-V, their compact crossover, is setting sales records. Meanwhile, it's like the car sales have stalled because people are migrating. This is a global trend. It's happening in China. It's happening in Europe even now, too. The twin to the Buick Encore is a small Opel called the Opel Mokka, which GM sells in Europe -- booming sales, booming sales. This is a small premium crossover. Just everywhere crossover sales are booming. That has also helped profit margins everywhere, because generally speaking you make a little more money on an SUV-shaped vehicle than you do on a sedan-shaped vehicle, especially now when demand is hot. This has also helped -- there are some questions as to whether, "Oh gas prices will go up and they'll shift back," but this trend was happening when gas was over $3 a gallon. It was already in place by 2012-2013. I think this is a long-term shift, which might mean more competition squeezes margins over time. Right now, everybody is making good money on crossovers. Ford and GM have among the best lineups of crossovers in the business. That's boosting them right now, too. But, again, generally, even crossovers are going to be a cyclical business. Sales will rise and fall with the economic cycles. Because it costs so much to set up a car factory, to run a car factory, to staff a car factory, the fixed costs in the business are so high, whether your factory makes 100 vehicles a day or 600 vehicles a day, a lot of those costs don't change. The higher the market, the fatter the profits. As the market contracts, profits get squeezed.